A finely crafted statue of Hanuman. Hanuman stands for pure devotion to God, complete surrender and absence of ego. This bronze statue has great detail work down to his feet and toes. Here he is kneeling on a doulbe lotus throne. Wooden Yali Antique Wall Panel Sculpture. This is a great piece of valuable collection. The handwork is very fine with incredible detailing. 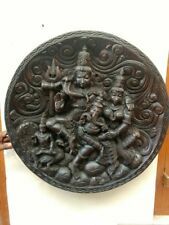 Hindu God Sree Rama Antique Wall Panel Wooden Temple Statue Ram Sculpture Decor. Material: Antique Wood. This is a great piece of valuable collection. the handwork is very fine with incredible detailing. Hook is provided on the back side for wall hanging purpose. Weight: 6 Kg(approx). This beautiful wooden sculpture art work is highly chosen & made from our most skillful artisans to accent the details of this stunning piece of the natural rare wood. • A masterpiece wood sculpture art work. We will work with you to until you are satisfied. LUCKY TOAD WOOD SCULPTURE BY PRECIOUS DRAGON BLOOD WOOD. - Money Toad represents a popular Feng Shui charm for prosperity. This wood type will turn a translucent red when held up to a light. You will get exactly the statue you see in the photos. We will work with you to until you are satisfied. This is a great piece of valuable collection. the handwork is very fine with incredible detailing. Don't miss out this chance to get it. To ensure quality and authenticity, we carefully check each piece with experts for dating a nd historical relevance. We are proud of our competitive pricing for high quality ancient and ethnographic art. Hook is provided on the back side for wall hanging purpose. Weight: 9 Kg(approx). This beautiful abstract wooden sculpture is an art work handcrafted from our most skillful artisans to accent the details of this stunning piece of the natural rare wood from Vietnam. Each natural wood pattern of this sculpture is unique & one of a kind in the world as the love for it of wood enthusiasts! This is a great piece of valuable collection. the handwork is very fine with incredible detailing. Don't miss out this chance to get it. 6-1/2”x7”x 2”. For an accurate quote, make sure you enter your Zip Code in the Default Zip Code Box. Vintage Hand Carved Wooden female African Figure Statue w/rare sand finish. Excellent condition. Shipped with USPS Priority Mail. Thanks for shopping with us. Bodhidharma, a famous character Buddhist monk who lived during the 5th/6th century and is traditionally credited as the leading patriarch and transmitter of Zen to China. He is the patron saint of the Shaolin Monastery, and is attributed to, in Chinese legends, to have begun the physical training of the monks that later turned into Kung Fu. Communication Can Sort Out Any Issue. 2" BUDDHA STATUE. WOOD CARVED. THEY ARE FROM THE EARLY 1970'S. CLOSE TO 50 YRS OLD ! ~~~~~~~~~~~~~~~~~~~~~~~~~~~~~~~~~~~~~~~. YOU WILL GET WHAT YOU SEE. (See Pictures for condition and details). Just A Wonderful Example Of Hand Forging With Iron & The Creativity Of Black Smith. Statue is fixed on a Fish shaped carved wooden block,Leg was broken accidentally and it was Pasted again ,repairingvisible. Weight: 99 Grams. Size:6" x 2.5" x 8" cm ( Length x Width x Height). Product Specification. 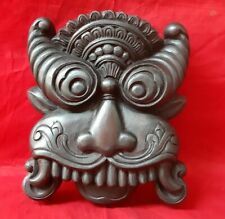 God Brahma Erawan Four Face Hindu God Bronze Lord Statue Holy Lucky Mini!! God Brahma Erawan Four Face Hindu God Bronze. THE LORD BRAHMA ERAWAN FOUR FACE GOD HINDU. Style : Asian Oriental, Hindu. Lord Statue Holy Lucky Mini! When you kept it with you, other people will love and kind to you. CODE - 145 - 1. OUR TOP MOST PRIORITY. IN CASE YOU FACE ANY PROBLEMS OR ANY. WEIGHT - 272 GM. YOU WILL GET WHAT YOU SEE. Make your collection more unique to buy it. See photos for more details and actual condition. 0.390 Kg. Size :- 15.5 x 3.5 x 3.5 Cm Approximate. T his Incredible and Beautiful item. is ready to be part of your great collection. Weight: 300 Grams. Size: 16.5 x 4.5 x 18.5 cm (L X W X H). Product Specification. 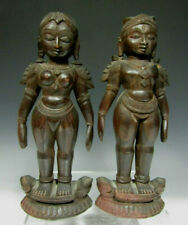 Very fine decorative Asian art work on cast bronze. Beautiful Asian bronze statue of goddess. 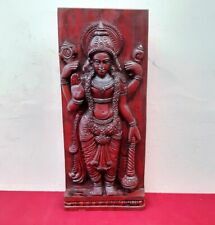 Very fine decorative Asian art work on cast bronze. THE LORD SERPENT. Materials : Copper bronze. Item details. LORD GANESHA ELEPHANT GOD HINDU AMULET. The Lord Ganesha God Hindu. SUCCESS WIN ALL OBSTACLE STATUE HOLY. The God Amulet will bring you Luck, Good things will unexpectedly happen to you.It also make you success in anything you hope for.This Amulet will bring Prosperity and ensure success in human endeavors. God Buddha God Hindu Bronze Lord Statue Sculpture Holy Lucky Eye Big Mini! God Buddha God Hindu Bronze Lord Statue. Style : Asian Oriental, Buddha, Hindu. Sculpture Holy Lucky Eye Big Mini New! Materials : Copper bronze. (WILL BE BEAUTIFULLY WRAPPED IN WHITE TISSUE PAPER). We have collected the all kind of Japanese antiques. Total Weight / 40 g. Color / Brown. Condition : Good. We are happy to understand you the matter. Even though it happens rarely, we do make mistakes on occasion. Gross weight (approx.). Material : copper or brass. Age : late 19th century or older. Net weight (approx.). Size (approx.). : 18.5cm/7.2" wide x 11.5cm/4.5" deep x 4.5cm/1.7" tall. Soft wood carved in a slightly faceted technique. Inscribed with a signature. Japan, Showa or Heisei eras, 1980s-1990s. This Daikokuten statue is one of the 7 gods of good fortune or Shichifukujin. He also symbolizes the realization of great ambitions. 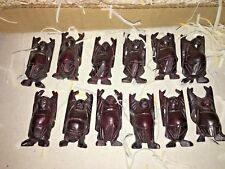 Vtg Japanese Statue 7 Gods of Good Fortune Iron Okimono. Material : Iron. We are happy to understand you the matter. We have collected the all kind of Japanese antiques. Worst two months. Total Weight / 3500 g. Color / Brown. Condition : Good. We will make every attempt possible to resolve the issue if we made a mistake. We have collected the all kind of Japanese antiques. Worst two months. Total Weight / 675 g. Color / Brown. Condition : Good. We are happy to understand you the matter. Even though it happens rarely, we do make mistakes on occasion.